You are already familiar with VMware vSAN, but you are not sure whether it is the right solution for your environment or whether you can justify its purchase especially an all flash configuration. 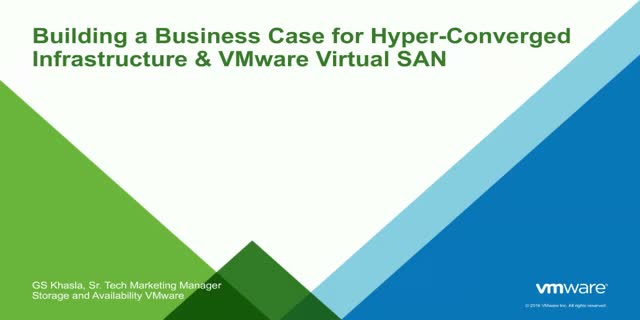 In this session, we will help you unwind this problem and help you build a business case for Hyper-Converged Infrastructure and vSAN. We’ll introduce you to practical tools like the vSAN Assessment and the TCO Calculator to help you get started with vSAN. Putting it all together you’ll get a very comprehensive understanding of if and where vSAN fits into your datacenter to power Hyper-Converged Infrastructure solutions. VMware’s vSphere 6.5, the latest version of the industry leading virtualization platform, solves for the top challenges for digital transformation including: increasingly complex IT environments, new cybersecurity threats, the need to support both existing and new apps and services, and the need for continuous operations and responsiveness. -How upgrading is the gateway to modern infrastructure. The majority of VMware vSAN deployments are used to run business-critical applications. It is imperative that a proper operations cadence is put into place and best practices are followed to help ensure the highest levels of uptime and performance. This session provides guidance and recommendations for handling operations such as monitoring health and performance, adding capacity, configuring fault domains, replacing drives and hosts, managing storage policies, and implementing data protection solutions. It is assumed that attendees are already familiar with vSAN. The session will include demos and offer plenty of time for Q&A with the speakers. Upgrading your IT operations -- even with the industry's leading virtualization platform -- is an unpredictable process. During this webcast, our technical experts will share common do's and don'ts for an easier virtualization upgrade execution for your DevOps and IT teams. Discover top considerations around architecting the migration to vSphere 6.5 from Joseph Griffiths, Solution Architect, and Logan Smith, Systems Engineer. During this webcast, they will address specific design "How-Tos" and deep dive into architecture best practices. vSAN continues to drive the rapid growth of hyper-converged infrastructure (HCI), adopted by more than 8,000 customers. One of the most popular HCI consumption models is the vSAN ReadyNode – pre-configured, tested and certified x86 servers designed for optimal HCI performance. Today, we have more than 300 pre-configured ReadyNodes listed in our vSAN Compatibility Guide, which includes certified CPUs, memory, network, I/O controllers and storage options available from our OEM partners across the globe. · How vSphere 6.5 is your gateway to modernizing your infrastructure so you can take advantage of VMware’s suite of products for the SDDC, including vSAN. As more and more systems become hyper-converged, it can be hard to know where to start looking when something goes wrong. In this troubleshooting deep-dive our VMware Support engineers discussed a common approach for vSAN, potential missteps and pitfalls, and provide tips on how to approach various errors and outages you may see while using vSAN. Questions on capacity, performance, and what to do if you encounter issues are were asked during the live Q&A. This session builds on foundational understanding of high-level vSAN architecture such as disk groups, fault domains, and cache and capacity tiers. We will begin with some examples of how vSAN distributes data in the cluster to preserve data integrity and availability and how rules in a storage policy affect data component placement. Infrastructure lifecycle management commonly requires hardware maintenance, firmware upgrades, and software patches. A hyper-converged infrastructure (HCI) powered by vSAN is no exception. This session will provide technical details on how to verify the health of a vSAN cluster and remediate configuration issues. We will cover the use maintenance mode options to help ensure virtual machines remain online during planned host downtime. The session will conclude with discussion on how vSAN effectively handles the availability of data when a disk or host goes offline temporarily or permanently with little or no warning. Learn how users are deploying their modern infrastructure and the best projects to target for your modernization project. We’ll discuss best practices for modernizing your infrastructure and results from real-world deployments. We’ll also give you the top uses cases for a modernized infrastructure, including hybrid cloud, enhancing existing applications and enabling new apps, edge computing for disaster recovery and remote offices/branch offices, and for IaaS deployments. In this session, we will discuss – and debunk – common misconceptions that you may encounter when planning to modernize your infrastructure. We’ll examine whether ‘build-it-yourself’ modernization deliver the same results as integrated solutions, if a modern infrastructure impacts the role of IT admins, how it effects the ROI of your existing infrastructure, the readiness of a simple, modern infrastructure for enterprise workloads, and whether or not infrastructure modernization leads to vendor lock-in. In today’s digital economy, a modern infrastructure can help IT keep up with rapid changes, making it possible to deliver apps and services more reliably, provision without hassle, and scale quickly. You’ll learn about the limitations of traditional architectures, the characteristics of a modern infrastructure, the VMware approach, and customer success stories. Come learn the technical details of the latest, innovative features in VMware vSAN 6.6 that are helping customers accelerate their path to a modern, secure infrastructure. We’ll also share the insight gained from our recently concluded vSAN beta program where the VMware IT user community tested out features and capabilities around the themes of security, protection, and management. Plus, learn how to better secure your data center, a top IT priority, and how you can accelerate your deployment of cutting edge flash technology. Hear from Lee Caswell, VP of Products for storage and availability, how the latest innovations in VMware vSAN 6.6 are helping customers simplify and accelerate their digital transformation. VMware vSAN, our award-winning software powering leading hyper-converged infrastructure (HCI) solutions, continues to evolve as a core building block for the Software-Defined Data Center. After Lee’s introduction, vSAN product experts will cover how vSAN enables you to seamlessly extend virtualization to secure hyper-converged storage, to reach your objectives for cost and efficiency, and to scale to tomorrow’s business needs. We’ll also share insights gained from our vSAN beta program where we focused on features and capabilities that informed vSAN 6.6, including security, protection, and management. Join us to learn how that latest features in vSAN 6.6 can help set your storage and availability agenda in 2017 and beyond. Business is moving faster than ever—and enterprise IT departments are struggling to keep up. Organizations need apps to run faster and more reliably, provision without the hassle, and scale on-demand while staying in budget. Hyper-converged infrastructure (HCI) makes all of that possible. Join us for the webcast to get a closer look at HCI, and find out how it can transform your data center. With 12.5 PB of storage deployed across 16 data centers in four continents, CenturyLink is one of the world’s largest cloud hosting and infrastructure providers. To keep up with their cloud customers’ rapidly growing demands, CenturyLink chose VMware vSAN to modernize their storage infrastructure. In this webcast, you’ll learn how vSAN identified and met their needs, how it allowed them to leverage their existing infrastructure and how they reduced their CapEx costs by more than 50%. With vSAN, CenturyLink now has the scalability and flexibility to quickly respond to changing business needs, and a solid foundation for their hyper-converged infrastructure. This session will give you a thorough overview of vSAN’s architecture, commonly used terms, and the benefits of its unique in-kernel design. Next, we will discuss vSAN 2-node and stretched cluster configurations and use cases. The webcast will conclude with insight into the new features of vSAN 6.5 including 2-node direct-connect, automation with PowerCLI, and iSCSI access for physical servers. Back in the day, rules were create for storage admins to make deciding on RAID levels easy. RAID 10 for performance. RAID 6 for bulk capacity. RAID 5 for… well… we’re not sure. But thanks to advances in storage technology like flash SSDs and virtual SANs, the rules of RAID are changing. Tune into this week’s On the Air, where we’ll talk about WHY these changes are meaningful and where we need to go with RAID from here. We’ll be sitting down with an IT pro from the Spiceworks Community as well as an expert from VMware. Technology is shifting faster than ever before with the emergence of new data center architectures, thanks to HCI, and new application architectures, thanks to cloud-native apps and containers. IT departments are faced with addressing immediate day-to-day challenges but also looking ahead to how they can embrace these emerging architectures. Luckily the virtualization revolution of the past decade means organizations are well positioned to evolve their current IT infrastructure to shift to HCI, which provides numerous advantages to cloud-native apps that have their own unique requirements that are important for IT teams to understand. VMware is focused on addressing these requirements as we continue to accelerate the evolution to HCI with vSAN. The hypervisor-integrated architecture of vSAN provides numerous benefits for cloud-native applications, whether deployed on own or as the underlying storage services to Photon Platform. On this channel hear how VMware can support your digital transformation to a modern infrastructure built from software-defined compute, storage, and network virtualization or through a hyper-converged infrastructure stack. Get the resources for how to make your data center flexible, agile, secure, with cost-efficient delivery and management of applications across private and public clouds.